There are many beautiful aspects of living here on the island of Utila. Many people think it would be absolute paradise to live on an island in the Caribbean. Before you get lost in paradise, here are a few pictures of the realities of living in a developing country. On Thursday, March 15th, 2012 this is what natives and tourists were greeted with when they arrived on the morning ferry. There was an abandoned airplane on the runway Wednesday, March 14. It was believed to be a drug plane, since the registered numbers were scraped off the plane and no one was to be found. This kind of action just doesn’t happen too often back where I am from, the USA. 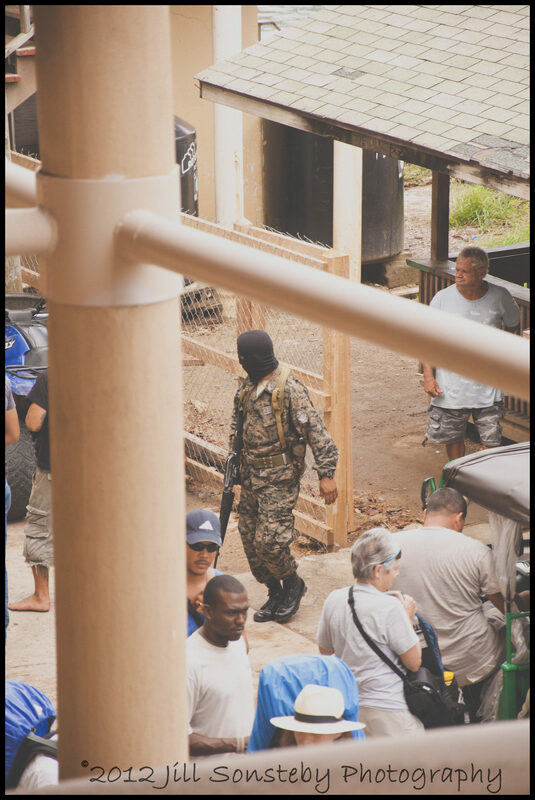 This masked fellow was among a handful of others in the drug trafficking investigation unit (DLCN) that was dispatched to the island to investigate the mystery plane. The runway was closed down for over a day because we were told the plane was on the runway. However, a pilot friend of mine confirmed that the plane was barely on the runway while the officials closed it down to all air traffic. On Thursday afternoon when the airport finally opened, my pilot friend made his way from La Ceiba back to the island only to find the abandoned plane now in the middle of the runway. Did you catch that? Let me recap…The runway was shutdown while the plane wasn’t in the runway and it was reopened to air traffic once they pulled the aircraft back onto the middle of the runway. This is one of those realities of living in paradise! 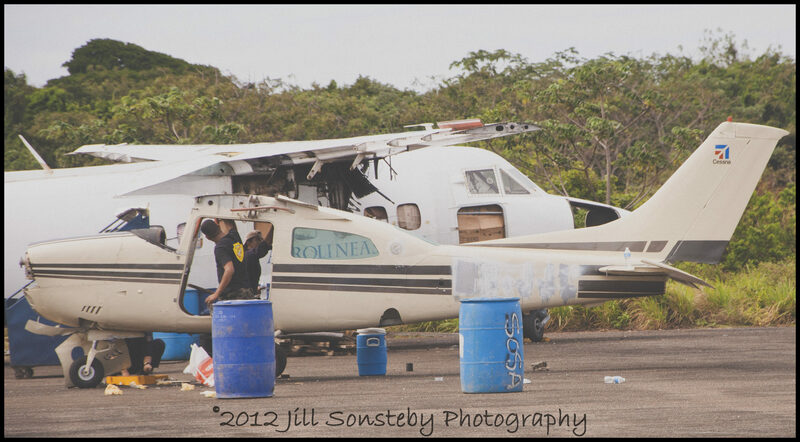 Here is a view of Utila’s Airport Boneyard! Police officials strip the abandoned airplane to sell the part. There is a larger plane behind this one that hit a cow on the runway and now is parked on the Utila tarmac. All parts are being stripped off and sold. ← 28 shirts. 39 pants. 29 skirts. 27 boys shoes. 24 girls shoes. Hello Jill, my wife found your site and I have to say it is totally awesome. Val and I were visitors to your island in February 2012 and had the pleasure to meet you and Jeanne. Anyway these images are certainly grim and I trust all concern has passed by now and the island is settled down. Great to also see how your passion for the children of Utila has grown legs and how you both are making such a huge difference to that island. Val and I were certainly touched by what we saw and the people we meet. Hope to be back someday soon! Hey Jill, I have to admit Utila has affected us both in a good way, so God willing you may just see again ~ hopefully sooner than later.